I haven't paid interest on this card once, no late fees and have had great customer service. Love the card, I own Amex too. Love both, miles for travel are so flexible with Venture Card though. I use it more. If you pay your balances in full like I do, then you won't have to worry about interest, just use whatever card that gives you the benefits you want. I have had this card for some time and have used it regularly until I did a review of all my cards interest rates. The application process is easy but than again I have excellent credit. I have 3 Capitol one cards and most are 21 to 23% now. They give you a n entry rate and then stick it to you. I pay them off each month but I am still not ok with it. The Rep told me that they have no specials to lower my rate and than told me that I should be ok since I pay them off each month. Really? I have excellent credit and don't have to take crap or use your cards. I will use the ones that have a lower percentage rate. 20 something percent is robbery. No think you. One positive is that they have good Customer Service. Disputes are handled properly and quickly. The interest rates are just a no go for me. I applied, and was approved with a $30,000 credit limit within 5 minutes! After spending $3000 within 3 weeks, 50,000 bonus miles was added to my account automatically! This paid off 2 hotel visits at $500, and I haven’t even had the card for a month! Really happy so far! Do you mind sharing your credit scores you had when you applied? Thanks Credit Karma, I was given very good approval odds for this card, and I applied through Credit Karma and was approved in about 3 minutes! The process was quicker and easier than I could have expected. I am less than 2 years post CH7 BK and was approved for a 10k limit. I am super stoked that Capital One let me have a "big boy" card so soon after bankruptcy. I haven't paid a dime of interest since I filed so i'm not gonna mess this up. Thank you Capital One for trusting me again. When I applied to this card exactly a year ago I was very excited! Who can say no to the 50,000 bonus free points?!?! Well I applied online and got approved for a $10,000 credit line within seconds. To my disappointment I did not receive the bonus points even though I did use the card minimum of $3,000 within the first three months! I called customer service after a few months when I noticed how low the points were, but they never added them to my account. I have only managed to accumulate 35,095 points or roughly $350 in one year. I have messed with the points to see what it looks like if I apply it to buy a plane ticket and it is not worth it. It shows the most expensive flights only. The other option is to cash out your points in dumb gift cards in increments of $10/25/50/100 or credit back the money as a payment for your card. I guess I don’t recommend this card. Did they say why you didn't receive the bonus miles? I am waiting on mine as well. Scared that they will not give me mine either. There's an annual fee that they didn't even try to remove, interest rate was ridiculous, and there wasn't any effort to retain my account despite my healthy card limit and perfect payment history. Application process was easy, but accumulation of miles vs the reward of the miles was really lopsided. I don't want to spend 5 figures on a card to get the equivalent of one domestic plane ticket. That's pretty much the same with every travel card. 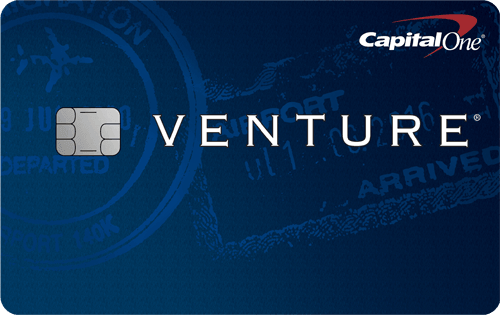 The Venture card gives a 50,000 point bonus + 6,000 for minimum spend. If it's your all-around go to card, then it'll do just fine for free travel. Best miles card out there. We use this card to pay for school and we've earned enough miles to send my husband and me to Nashville, Sacramento, and Puerto Rico this past year. After hearing about the amazing rewards, most of my family got their Venture Cards too! It's a great credit card with amazing perks and exceptional customer care. Para empezar te ofrecen un excelente bono de introduccion de 50K millas, en mi caso las tranferi con Aeromexico y en puntos premier que es el programa de esta aerolinea fueron algo asi como 43K, eso es equivalente a un voleto ida y vuelta de Boston a Guadalajara en clase economica GRATIS. ademas te ofrecen pagar por tu membresia de Global Entry con un costo de 100 usdlls. y el primer año la anualidad es gratis...no veo por que la gente tiene quejas??? Para mi es una buena tarjeta o puedo decir la MEJOR tarjeta en su categoria. If you're paying the full balance off every month, interest rates don't/shouldn't matter. Credit cards have variable rates. As prime fluctuates so will your card interest rates. The things they should teach people in school. What a horrible customer service!!! So called supervisors are there to annoy you more instead of offering solutions. Long story short, My request got declined to increase of credit line, supposedly, due to financial obligations I have. What a joke!!! Well, when I checked the date my request got declined I had 816 score on equifax and less then 8% I owe on cards. So it’s apparent that there is some sort of mistake going on. Neither first customer care person nor the so called supervisor-his name was Jordan- would not bother to help or offer any solution. I have had this card for about 10 months and I spent probably more then 400k, during this time. I am never using this card again. 400k in 10 months? Sounds like a high risk. I won't blame Capital One. JC the card must have been paid off every month. I'm sure there's no 400k credit. Sounds like a good customer not high riak. Just curious why you picked this card with the credit score you claim to have?